Participants and coaches in the “Savings for Success” program pose for a photo. 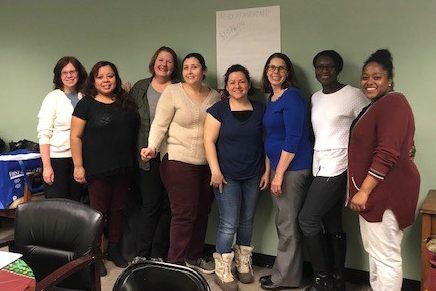 January 9, 2019 – “Savings for Success,” a financial education and savings program spearheaded by the Evanston Community Foundation and YWCA Evanston/North Shore, recently completed a yearlong pilot, and participants and coaches deemed it a success. The primary goal of “Savings for Success” is to help families save for their children’s post-secondary education through dedicated 529 college savings accounts. It also gives families tools to improve their financial health and security by reducing debt and planning for unexpected expenses. “We learned a lot as a family about how to manage our money, and the accounts are very important for the education of our children,” said one woman who participated. According to Paul Brenner, a community volunteer who provided leadership for the program’s creation with the Evanston Community Foundation, the pilot included six families, with a total of ten children, who together saved $1,376, an average of more than $130 per child. For their efforts, these families received matching funds in their 529 accounts from the Evanston Community Foundation, as well as financial literacy training from the YWCA. Research has shown that children from low- and moderate-income families with college savings of $1-$499 are three times more likely to attend college and four times more likely to graduate. Brenner, Evanston Community Foundation board and staff leaders, and Shannon Callahan from YWCA Evanston/North Shore, were selected to participate in a nine-month learning program on children’s savings accounts with five other community foundations through CFLeads, a national network of community foundations working to build stronger communities through community leadership. In the second year of this pilot, “Savings for Success” will work with a small number of families from several Evanston early childhood education programs. Callahan, who serves as YWCA Evanston/North Shore’s director of women’s leadership and economic advancement, said the “Savings for Success” program is aligned with YWCA’s mission to empower women and support families through financial education. “We’re excited to build on this program and help families exert greater control over the financial futures, including their children’s education,” she said. To learn more about “Savings for Success,” contact Shannon Callahan at scallahan@ywca-ens.org or call YWCA Evanston/North Shore at 847-864-8445.